My son, Nathan, loves fish!! He loves reading, seeing, and eating in relationship to FISH !! Today, I am sharing some of my son's artwork based on his love of fish and water!! 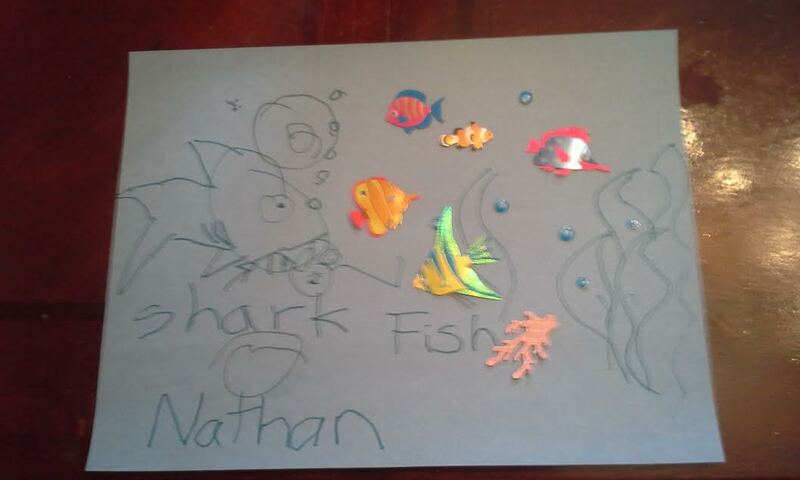 Nathan loved stickers growing up before actually using pencils, markers, or crayons in school and home but whatever perks his interest and imagination to become involve with art!! I found these at local AC Moore and let Nathan first draw his shark and then write it below! 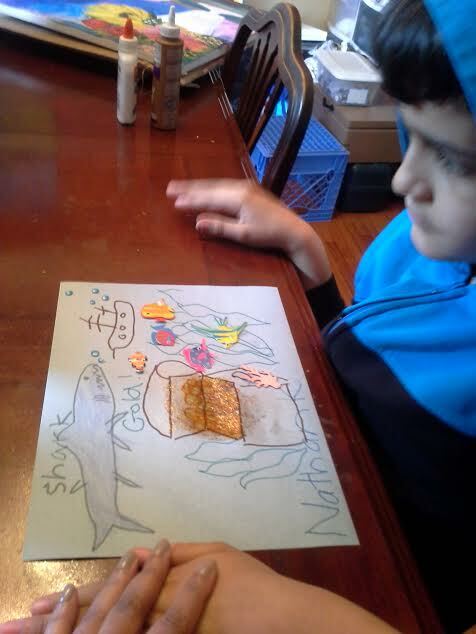 Next, I let him place the fish stickers in a free area of the paper and helped him to draw seaweed so the fish can hide from the shark and then helped him write "Fish" under them! Nathan takes great pride in writing his name so I helped him write below his art work! I asked him, "Who did this picture?" and he proudly says, "I did it"!! 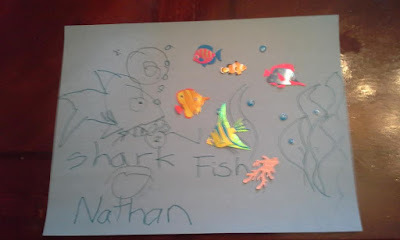 With the second fish picture, Nathan recycle the back part of this construction paper and drew another shark/fish theme with sunken ship in the back ground and golden treasure chest with gold glitter!! He asked for "help" to draw this shark but I thank Nathan for asking for help which is all part of increasing his communication skills! I hope to get different fish sticks besides the sponge art to help with Nathan's creativity in his artwork especially his passion for his favorite subjects, FISH! !